Hi folks, today we’d like to tell you about a great cat book you should now about. 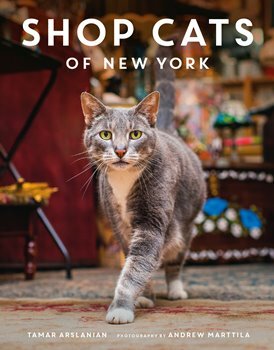 It’s titled Shop Cats of New York and it is a wonderful book written by one of the most influential figures in the global cat community Tamar Arslanian. We sat down with with Tamar to hear more about one of the most talked about cat books today. Hello, thank you so much for taking the time to interview me. I’ve spent most of my career as an advertising account executive in New York City advertising agencies. I currently share my home with two rescue tabbies Kip and Haddie. My blog, I Have Cat, began as a passion project. Growing up I was involved in all sorts of activities relating to the arts – ballet, violin, theater. But once I moved to New York City and started working longer and longer hours I didn’t pursue any of them. One day as I was regaling a friend with humorous cat stories she suggested I start a blog. I’d never considered myself a writer but I gave it a shot with her help figuring only my close friends and family would ever read it. It was fun to start meeting people from all over the world through the blog and associated social media platforms – we have rather large Facebook, Twitter and Instagram communities. Q2: Tell More About the Inspiration Shop Cats of New York? Jack, a cat living in a wine store a block from me, was the first shop cat I encountered. By chance he actually made it into the book as the very first chapter! Kitty, who lives in a Pilates studio, is the other neighborhood cat who helped inspire the book. My cat loving friends living in NYC would often tell me about or share photos of cats in a variety of businesses in their neighborhoods. Many people seemed to be aware of bodega cats (deli cats) but there didn’t seem to be much coverage about cats living in different business who were beloved and very well cared for. 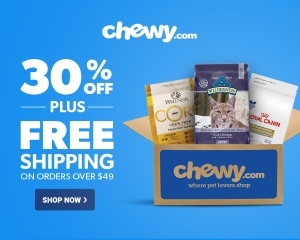 Cats living in places like bike shops, real estate offices and even dog boutiques! Q3: What Do You Think Made Shop Cats of New York such a Big Hit? 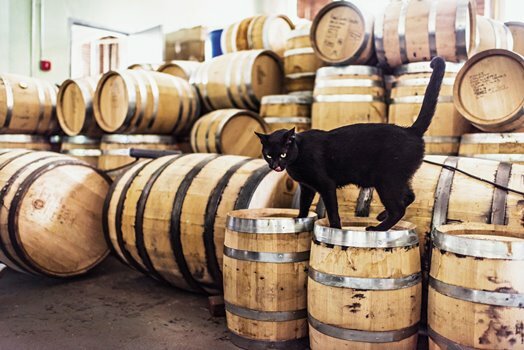 I think it’s a great combination of two well liked and popular topics – cats and NYC! These cats have stories to tell and create a sense of community in what can often feel like a large and impersonal city. It’s also a visually stunning book (if I don’t say so myself!). The photos were taken by my friend Andrew Marttila, a popular cat photographer with the handle @iamthegreatwent on Instagram, and HarperDesigns (of HarperCollins) designed the hardcover book. I love the literal feel of the book! Q4: Will there be a sequel to Shop Cats of New York the future? I would love it! But that’s up to continued sales and the publisher! So snag a copy for yourself and a few as gifts if you haven’t already! We’ve received over 80 positive Amazon reviews and love seeing people post photos of themselves and/or their cats with the book on Instagram (#shopcatsofnewyork). A beautiful book of beautiful photos of beautiful cats by beautiful people. Shop Cats has a special place in my tiny heart. —Jackson Galaxy is the host and Executive Director of Animal Planet’s hit show, My Cat From Hell. Hahaha 🙂 Where where you last night Mr. Chips? The book looks amazing I wonder how they made those amazing looking photos? Anyway it looks beautiful. ConCATS on another great interview, Tamar! Here’s to great success and a sequel! *SON OF SHOP CATS OF NY*! I can see it now!